For example, when cast-in-place, hardened concrete has suffered an efflorescence problem on its surface, the white salt bloom deposit is often patchy but sometimes consistent and uniform. These disfiguring white crystalline salts mask, partly cover or occlude any colouring pigment in the concrete at the surface and makes it change colour and appear to have faded. Through coloured concrete below this thin problem layer of leached material is usually perfect, non-fading and permanent. Ugly efflorescent salts on these surfaces may not disappear. Sometimes they carbonate (combine with Carbon Dioxide [CO2] - in the air), become permanent calcium carbonate and are therefore extremely difficult to remove permanently. To eliminate this possibility and protect yourself from complaints of ‘poorly coloured’, ‘blotchy’, ‘frosty’, inconsistent cast-in-place concrete, concrete products or mortar jobs which are non uniform in appearance as a result of efflorescent salts coming to the surface - particularly those which are integrally coloured - we highly recommend the use of Efflorein® Mark 2 powder in the mix. Efflorein® Mark 2 is a unique multi-purpose chemical admixture formulated for use with Portland cement binders used for making concrete and other composite materials. It is supplied as a free-flowing, non-caking white 100% effective powder and is packed in 20kg net multi-wall degradable Concrete- Friendly® paper sacks used as recommended. It stops efflorescence! It also brightens and strengthens the effects of pigment colours as well as very effectively waterproofing hardened concrete or mortar. Efflorein® Mark 2 powder is a versatile cement dispersant, lubricant and multi-functional conditioner for plastic cast-in-place concrete. It allows the concrete’s mix water content to be lower for the same liquid consistency and degree of workability in plastic mixes, resulting in higher mechanical strengths and surface hardness of the hardened product(s) and materials. Efflorein® Mark 2 powder is a safe, highly efficient cement defloculator which has been especially designed and formulated to effect ultimate dispersion of both reactive cements ultra-fine particle pozzolanic mineral admixtures and non-reactive finely divided pigment powder in concrete. It is a most efficient, reliable dispersing agent and mix batch workability increaser for Portland Type GP, Blended Portland - Type GB and most other types of Portland cement-based concretes and mortars. Water reduction of a plastic, wet mix, for a given slump, or degree of liquid consistency, increases the strength of hardened concrete and mortars. Efflorein® Mark 2 powder disperses in the mix to safely separate cement particles, by chemical de-flocculation, to overcome the cohesive forces that attract them into clumps or flocs so that less water is needed for a given degree of concrete or mortar plastic workability and processability. Efflorein® Mark 2 is normally added to prepared 40mm slump plastic pre-mixed concrete (instead of the normal 80mm) in the transit mixer. It is then remixed for 8 minutes at the transit mixer’s mixing barrel speed (16-18 RPM). Efflorein® Mark 2 may be added to previously prepared/freshly mixed* plastic concrete and mortar mixes at 11/2 % ± 1/2 % by weight, of the cementitious weight. The usual dose rate for 40mm slump concrete is 1 x 20kg bag of Efflorein® Mark 2 powder per 4m3 of concrete based on 300kg Type GP cement/m3 (32 MPa) (approximately 0.7kg per 40kg bag of cement or 1.7%, weight for weight, of the cement content). Even lower dose rates may be used if found on prior test to be effective. Efflorein® Mark 2, stored under cover, off the ground on pallets has a shelf life in excess of 12 months and is not normally affected by damp atmospheres or high humidity conditions. It flows freely through powder dispensers, production slides, shutes, hoppers and bins etc. Imparts extremely high workability, pumpability and finishability to freshly mixed plastic 40mm ‘slump’ concrete or rendering and masonry mortars etc (ie all having about 20% (1/5) lower than normal water content) which after its addition to the mix and adequate re-mixing the concrete slump becomes a normal 80mm. That is, the Efflorein® Mark 2 admixture modified mix has higher true workability, trowellability, extrudability and rheological characteristics than a normal unmodified mix at the same slump. With reduced water content and increased workability in its freshly mixed plastic state, Efflorein® Mark 2 modified concrete, potentially provides quality highly durable, abrasion and weather resistant, hardened concrete in place, with less shrinkage. Less shrinkage means less cracking potential. Efflorein® Mark 2 assists in making it possible to strip formwork / shuttering from Extra High Strength Concrete (EHSC) of 80 MPa or higher, and EHS precast concrete units from their moulds for vibrated and finished concrete having its temperature maintained at 20°C during the setting, curing and hardening periods within 12 hours. Production output is therefore increased. Satisfactory concrete curing (prevention of the evaporation of the concrete’s mix water) must, of course, continue after stripping to attain the f/c concrete design strength - after 28 days. * By freshly mixed concrete we mean wet concrete of a given mix design (the characteristics of which have been established and are well known) at virtually any stage prior to the time it would normally take, at a given concrete temperature, to partially thicken and decrease in slump by say more than 20mm to indicate early signs of setting. Efflorein® Mark 2 results in increased ultimate mechanical strengths of hardened cast-in-place concrete - mainly but not only from the aspect of water reduction - whilst still maintaining a highly cohesive, workable, pumpable and easily placable, compactable and finishable, pre-hardened /plastic mix, having a typically normal 70-80mm slump with the actual water content of only a 40mm slump! Efflorein® Mark 2 minimises the amount of fuel energy required from shorter steam, burner or other types of accelerated, elevated temperature and humidity curing/hardening method times used in the manufacture of ‘slump’ pre-cast concrete products. However, normal preset times, (maturing time before the concrete temperature and humidity is elevated) should be maintained or even increased. Efflorein® Mark 2 is usually added into prior-mixed plastic concrete having a 40mm slump by tipping it into the concrete agitator transit-truck barrel (or factory/site mixer) with or without an abilox® colouring oxide pigment. The concrete is then efficiently RE-MIXED AT THE MIXERS MIXING BARREL SPEED FOR 8 MINUTES prior to discharge, placement, compaction by vibration (to remove air voids and thereby densify the cement paste), finishing and finally the curing procedure curing in normal ways. The usual dose, to prevent the occurrence of primary or secondary ugly white efflorescent salts, and ensure a perfectly uniform colour is 1 x 20kg bag of Efflorein® Mark 2 for every four (4) cubic metres (4m3) of pre-mixed concrete containing a minimum of 300kg of type GP Portland cement per m3. The liquid consistency slump of the concrete should be ordered at 40mm (instead of the usual 80mm). After the addition of Efflorein® Mark 2 powder, and remixing adequately for 10 minutes at the fast transit truck barrel speed, the slump automatically increases to an easily placable consistency of about 70-80mm Further small quantities of water may be added, if considered absolutely necessary, and the concrete properly re-mixed again (for 8 minutes at the fast barrel speed) prior to discharge and placement. However additional water is usually not necessary and is not recommended. If the less preferred ‘Dust-On’/’Dry Shake’ surface colour/‘hardener’ method of concrete colouration is being used compared with the preferred integral (‘through colouring where the colouring pigment(s) are dispersed throughout the whole mass of concrete’), method, one 20kg bag of Efflorein® Mark 2 powder is just as effective for this method. The product is added into 4m3 of normal plain un-pigmented plastic concrete in the transit truck at the pre-mixed concrete supplier’s plant. The concrete is then re-mixed for 8 minutes , prior to its discharge placement and further standard site processing procedures as described previously. Efflorein® Mark 2 powder may also be added to factory or site prepared ‘Dust- On’/‘hardener’ dry shake colour mixes at the rate of approximately 0.7kg per 40kg bag of the cement component. 1. Efflorein® Mark 2 reduces the amount of water needed for all types of concrete and mortars. About 20% less water is required for a given workability when the product is added and adequately mixed into a previously prepared plastic concrete mix. A reduction of the total water content, without reducing normal workability /placeability, results in higher strengths when concrete hardens, with a less porous, denser, harder internal structure and surface. The hardened concrete surface therefore has higher impermeability to liquids and is harder with potentially higher erosion, abrasion and wear resistance. It will as a result wear less under a given amount of traffic and last longer. We recommend that the required pre-mixed concrete strength grade or class be ordered from the pre-mix supplier, or manufactured at the precast factory at a slump of no more than 40mm (13/inches). Efflorein® Mark 2 powder is then added and the concrete is re-mixed for 8 minutes at the mixing speed of the barrel. The slump then automatically increases to approximately 70-80mm without the need to add extra water. The Efflorein® Mark 2 treated concrete is typically more easily discharged and/or pumped, placed and more easily compacted/vibrated as well as being more easily finishable without bleeding (mix water rising to the surface). Curing (mix water retention) immediately after setting is still strongly recommended to obtain the full strength of grade/class of concrete used in place. Efflorein® Mark 2 powder when added to the concrete mix, after all of the other components have been added, including the recommended reduced amount of water, and adequately re-mixed at the fastest mixer barrel speed, makes concrete much more workable without adding more water to increase the slump. Efflorein® Mark 2 adds plasticity to freshly prepared concrete - resulting in easier and quicker placement, vibration/compaction to densify the concrete and eliminate air bubbles, (10% of which by volume in hardened concrete reduces the ultimate compressive strength by 50%! ), finishing (screeding and floating) and, if intended, pattern imprinting. Faster too! Construction time means money so the use of Efflorein® Mark 2 means higher profits to the concrete site processing placement/finishing contractor or to the precast/ concrete products manufacturer by taking less time to produce a QUALITY product with a quality finish. If operators usually get paid per hour and not by performance, a greater number of products or placed concrete, or output will mean increased profits. Efflorein® Mark 2 waterproofs the hardened (and cured) concrete very effectively. It is probably the very best moisture barrier additive for concrete and mortar available in the world today! Efflorein® Mark 2 powder is a far better waterproofer than stearate based liquids such as Ammonium and/or Butyl Stearate. Everybody will realise the benefits of having watertight, hardened concrete. Hardened waterproof concrete means no leakage or seepage - even if subjected to blinding, wind driven rain, which falls constantly for weeks on end. It is always dry inside with Efflorein® Mark 2 treated concrete. Freedom from water leakage and liquid penetration into hardened concrete also assists in guarding against discolouration and staining, as well as preventing corrosion of reinforcing steel and concrete cancer in reinforced concrete. The treated, hardened concrete has higher resistance to chemicals, salts, marine atmospheres, sulphate and chloride waters, CO2 solution (carbonic acid) chlorine, weathering and erosion. It is worth noting here that hardened cured concrete having an ultimate compressive strength of 40MPa, and higher, that was adequately compacted in its plastic state and made with a maximum of 190 litres water/m3 is virtually watertight and does not usually need a separate water-proofing additive. However, Efflorein® Mark 2 powder can considerably assist in obtaining watertight concrete for in-place concrete grades lower than N40 (40MPa) - particularly N20 (20 MPa) and N25 (25 MPa) grades which are site processed without the adoption of a curing procedure. Efflorein® Mark 2 powder, added to virtually all cast-in-place slump type plastic (unset) concrete, is a strong suppressant of bleeding. Bleeding is the phenomenon of some of the plastic concrete’s mix water rising to the surface, after placement, compaction/ vibration and screeding. Bleeding often causes gross delays in finishing - especially in cold weather, as well as laitance* - a thin, weak, often dusty surface layer of cement scum, which usually forms on the surface of set concrete, which has bled. Laitance is the cause of dusty concrete, floors and pavements that wear rapidly. It also prevents the proper and satisfactory adhesion of coatings, surface treatments, paving paints, cement-based paints, silicate paints, penetrative sealers** and finishes etc, applied without its removal after the concrete has hardened. Bleeding results in hardened concrete that is porous, absorbent and permeable. It is often a big factor in the cause of white ‘frosty’ efflorescent salts and bloom appearing at the surface. In addition to controlling bleeding, Efflorein® Mark 2 controls the occurrence of laitance and efflorescence as well as allowing speedier, denser, tighter finishing of concrete slabs, pavements etc. * LAITANCE is defined as cement scum or a whitish deposit of weakened cement ‘fines’ that rises to the surface of freshly placed, plastic slump concrete, during the process of screeding and compaction. It is usually more apparent when the concrete bleeds and is NOT cured. ** Coating products such as Ability’s Duro-Seel Clear, AQUAdura, Dy-On-Crete® Mark 2, the Paint, X55 Hi-Seal paint etc. Efflorein® Mark 2 powder added as an admixture into plastic cast-in-place concrete (and into applied, and other types of mortar/ grout mixes and rendering) and after the essential raw materials (including the reduced water component) have been added to the mixer and remixed thoroughly for about 10 minutes, also greatly assists to brighten and intensify the colouring effects of mineral oxide colour pigments (any brand) if used in the mix. Coloured concrete consists of good quality concrete, containing an optimum cementitious content plus the addition of a fixed amount, by weight as a percentage, based only on the weight of the cementitious content of ultra-fine, particulate, non-dissolving, non-fading, colourfast powder colouring pigments such as the abilox® range from Ability. In addition to lowering, or if enough Efflorein® Mark 2 powder, is added, preventing the occurrence of efflorescence and laitance (both of which can ‘cover’, ‘mask’, ‘dilute’ or ‘occlude’ the colouring effects of pigments at the surface), Efflorein® Mark 2 brightens and intensifies the colouring effect obtained with these micro-size particle pigment colourants by considerably improved dispersion/particle deagglomeration - a process which usually results in stronger, brighter colours for products and materials in a given mixing time. It also makes for better uniformity and evenness of the final colour result. Efflorein® Mark 2 considerably assists to ensure the production of uniformly coloured normal unpigmented concrete as well as uniformly coloured, pigmented concrete with bright, clean, strong colouration, which is permanent and non-fading! The final colour, which can only be truly assessed after approximately 7 days (for normal non heat/ humidity treated coloured concrete, cured at ambient air temperature and humidity conditions), is largely related to the dose rate, by weight (NOT volume), of permanent colour pigment used in proportional relationship to the cementitious content by weight. Example: 1 x 25kg bag of the high performance abilox® BLACK IRON OXIDE CAF-X2 pigment added to every cubic metre of plastic concrete based on 300kg cement/m3 is a dose rate of 8.3% by weight of pigment on the cement weight. With the addition of Efflorein® Mark 2 admixture, the full colour intensity - proportional to the dose rate, by weight, of pigment to cement or cementitious binder weight, is developed throughout the mass of the concrete and shows beautifully and permanently at its surface without surface colour defects. Do you want fine detail to be preserved and easierrelease from moulds and formwork? This is usually effected, with hardened concrete products, pre-cast units and shapes - either pigmented or plain - when Efflorein® Mark 2 is added as an admixture and re-mixed into prepared low slump plastic concrete mixes prior to them being cast into moulds and followed by adequate vibration and compaction procedures. subtleties of moulded concrete articles. mixed, Efflorein® Mark 2 treated, plastic concrete into them, the use of a form oil, or chemical release agent, is often unnecessary. 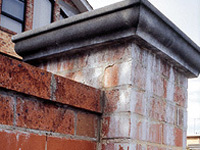 Also, the build-up of hydrated hardened cement dust / residual concrete on the insides of concrete moulds is lessened with Efflorein® Mark 2 treated concrete - provided that the concrete products are of sufficient adequate hardness, related to the cement content, temperature and time, prior to being de-moulded. Efflorein® Mark 2 reduces this time at a given concrete temperature. Efflorein® Mark 2 powder imparts higher earlier ‘green’ strength (prior to and just after setting) to freshly moulded concrete products, which have not yet hardened completely. Therefore, the amount of breakages and wastage is reduced resulting in a higher percentage of saleable products. Ability’s Efflorein® Mark 2 has been used for many years now - since 1986, by many manufacturers of concrete masonry blocks, bricks and pavers as well as producers of concrete roofing tiles, in their no slump semi-dry mixes. Machinery operators in these factories have become aware of less wear on machinery parts. Thus, savings have been made by not having to replace these expensive parts as often. This additional feature of Efflorein® Mark 2 is basically brought about by the thixotropic nature of a prepared concrete mix containing it. Efflorein® Mark 2 imparts thixotropy, and better rheology or plastic concrete mix characteristics/ working and moulding properties, to prepared semi-liquid mixes and this makes compacting and moulding machinery work easier, better, more efficiently and with less wear. Thixotropy improves the rheology - the flow and workability characteristics of prepared plastic mixes. Thixotropic materials are liquids, or semi-solids, which are ‘stodgy’ and firm when static, but flow with greater ease when subjected to movement, shearing, vibration or mixing. So, Efflorein® Mark 2 imparts flowing qualities, to slump type (pre-mixed) plastic concrete when it is subjected to vibration, screeding, shear or movement, without increasing the slump or measurement of consistency (reducing the viscosity) of a plastic mix by adding extra water. This flowing quality, of plastic pre-mixed concrete mixes, results in distinct handling advantages, including the way it moves under a trowel or ‘bull’ float and that of pumpability /extrudability, whilst maintaining high quality and lasting durability characteristics of the hardened product. The adoption of an acceptable curing procedure of placed concrete and concrete products is very important. Curing means keeping the mix water in, ie the retention of as much of the (preferably) low water content used to mix the concrete (with the aggregates and cement), as possible, within the concrete, after moulding, compacting/vibrating, finishing or shaping it and therefore to prevent it from evaporating. This retention of the mixing water, a procedure which must be highly commended as soon as concrete has set at ambient (typical) air temperatures and humidity to occur on a continuous basis for as long as possible - certainly for at least 14 days, and preferably, for 28 days or even longer. The prevention of the evaporation of the mix water after the concrete has set, allows it all to chemically combine (or hydrate) with the cement, completely! Thus, the quality and durability of the hardened concrete becomes optimum and ideal. If the chemical process of hydration is allowed to occur to its maximum, the mix water, if not to excess, will become part of the total weight of the ultimately hardened concrete. The other part of the hardened concrete’s total cured weight, will be the original weight of the aggregates and the dry (powdered) cement used which has formed into a ‘glue’, consisting of binding metal silicates, to permanently bind the aggregates. In other words, all of the water H2O molecules are chemically combined - so long it is prevented from evaporating. The retention of all of the (preferably low) mixing water over a 28 day period or more allows it to chemically combine with the cement to produce hydrated cement paste - the hardened silicate ‘glue’ which holds and ‘binds’ the aggregates together by a process called ‘concrescence’. The glue is of the highest ultimate quality, hardness, density, watertightness and lasting nature when the water to cement ratio is kept proportionally low. Efflorein® Mark 2 contains humectants or moisture retention aids Moisture retention in placed concrete although not a complete replacement for an ultra efficient curing procedure or process, aids and does help to keep and hold the mixing water within the concrete, even after setting - and considerably assists to prevent its evaporation into the air around the concrete in place. Thus, a higher quality, better cured, hardened concrete is the result. Efficient liquid (‘membrane’) Curing Compounds may be applied by suitable spray equipment or soft broom (to act like a large paintbrush) to form moisture retentive coating films on the surface of freshly set concrete and concrete products. These are applied immediately after the concrete has set, product example: Ability’s Duro-Seel Clear. The use of Duro-Seel Clear may not be necessary when Efflorein® Mark 2 powder has been used as an admixture in the prepared plastic concrete mix. However, curing compounds may still be specified and used, as extra insurance, for optimum quality results and are therefore recommended for use. Virtually all cement-based products - coloured or plain - are optimised with the incorporation of Efflorein® Mark 2 powder in the mix! Your Cast Concrete, Concrete Products, Mortars/Grouts etc Deserve Efflorein® Mark 2, and you deserve the increased benefits, profits and name fame, from specifying and using it! Please, always remember to: Test first before actual use. It is highly recommended that the suitability of any Ability product for any use be confirmed by the user by thorough prior testing and evaluation.